Christie's, the London-based auction house, which has restricted itself to the sale of original antique art and design for 250 years, will be auctioning its first outstanding pieces of contemporary design at Rockefeller Center in New York City on September 8, 2008. This gives private design collectors the opportunity to bid on items from some of the most renowned furniture designers of the late 20th and early 21st centuries. What characterizes my top 10 of Christie's perfectly rendered examples of current interior artistry is the unbridled exploration of new materials in furniture making, the barrier-breaking use of traditional items to create nontraditional functions, and the challenges to the staid characteristics of furniture. It should be noted that while all of these furniture designs are works of design art, they are not necessarily functional as furniture. Slice is a laser-cut aluminum chair, one of 20 originals made. According to Christie's notes, the chair was first made of plywood, then aluminum, as you see here, and then foam! The aluminum Slice is a masterful feat of hand-crafting as well as machinery. 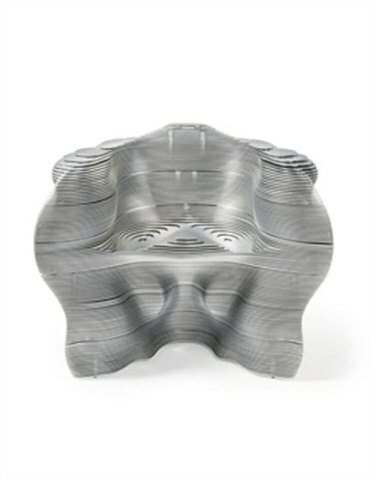 Though the many parts are machine-lasered into 2-dimensional pieces, they come together in a perfectly 3-dimensional organic chair, only made possible by hand-working. Christie's estimates the value of Slice at $20,000 - $30,000. You can learn more about the Slice chair or bid on it here. 'D' is described as "a mirror-polished stainless steel sofa." The "D" is marked number six of 100 and it's value is estimated at $200,000 -$300,000, one of the most expensive items on this Christie's auction. To learn more or to bid, go to this page. 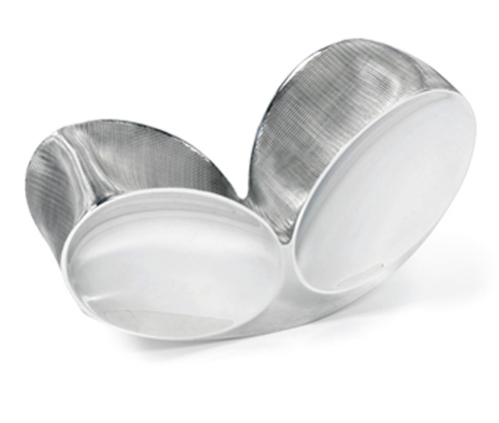 The Blo-Void design is one of Ron Arad's most famous chair designs; I could find five different series of the Blo-Void design. The chair being auctioned is from Series 2, the first in a series of 20 made. The chair is made of polished and anodized aluminum and aluminum mesh chair, and its fabrication date is 2006. Christie's value is $50,000 - $70,000. Learn more or bid here . 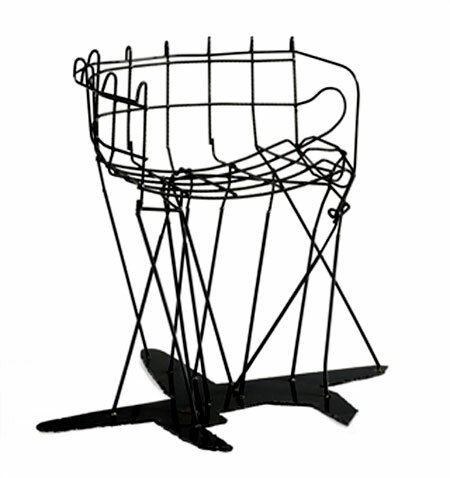 Created in 1991, Pandora's Box is a full-sized chair made of anodized aluminum wire and anodized copper. 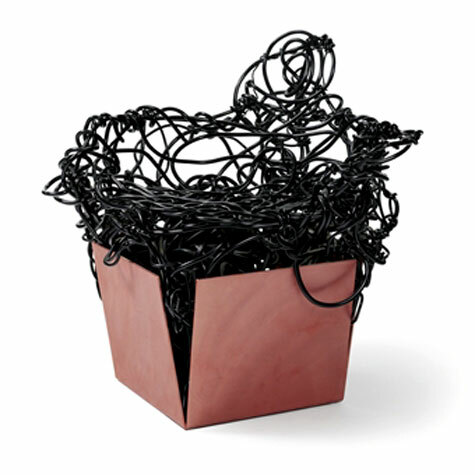 Christie's notes on this piece indicate that Myers became a fan of writer and inventor Buckminister Fuller and that Pandora's Box represents Fuller's theories in its implied tension - the struggle for the tangled wire to get out of the box. Pandora's Box is one of a series of sculptured designs that Myers made. It is valued at $20,000 - $30,000. You can bid on or learn more about Pandora's Box here. This edition of Second Hand, designed in 2006, is a bookcase, made from a variety of painted remnants that had other functions in their first lives. Recycling at its purest, Baas created a series of Second Hands, this one for Droog Design . Christie's has valued the Second Hand bookcase at $20,000 - $25,000. Learn more or bid here. This prototype of a "steel and paper chair" was designed by Tom Dixon, in 1991, and it was later developed by Italian design house Cappellini. 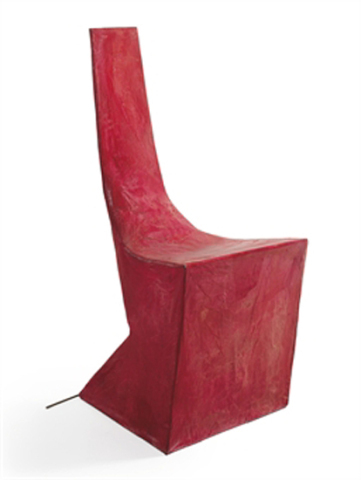 Experimental in both the unbalanced concept of the chair and material choice, Christie's value of the Dixon prototype is $7,000 - $9,000. Learn more about the prototype chair or bid here. The acrylic and aluminum stool with feathers is number 31 from an edition of 40 that can be found in galleries worldwide. The fascination with light, so pervasive in modern design, shows up in reflective qualities (e.g., stainless steel, aluminum, etc.) in many modern works, but Kuramata is known more for his transparent furniture designs. He uses acrylic as a solid base and inserts objects in movement, like the feathers, into the base where, of course, they become frozen in time. This piece is estimated at $80,000 - $100,000. To bid or to learn more about it, visit this page. 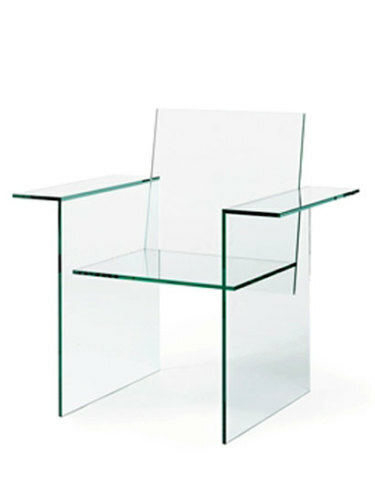 This 1976 work of Kuramata, the Laminated Glass Chair, is one of the first modern examples of challenge to the functional characteristics of a chair. The traditional view that a chair must be substantial and balanced enough to support our weight, to let us rest. Kuramata takes on this notion with a rather tenuous-looking geometric design that calls itself a chair... and it is glass! 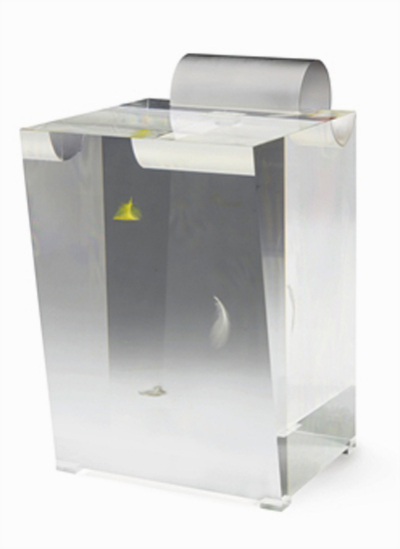 Christie's estimates the value of the Laminated Glass Chair, number 29 of 40 made, to be $50,000 to $70,000. Find it here. In 2004, Zaha Hadid became the first woman to have ever received the prestigious Pritzger Prize for Architecture. Her architectural and interior design works are many and admired. Nekton is a set of four gloss laminated polyurethane resin stools. Up for auction is number six in the series of 12 of the Seamless collection, made in 2006 by Established & Sons, UK. Though there is nothing light or airy about the Nekton, it is very fluid, another challenge to prior views that chairs must establish boundaries that separate and control movement. 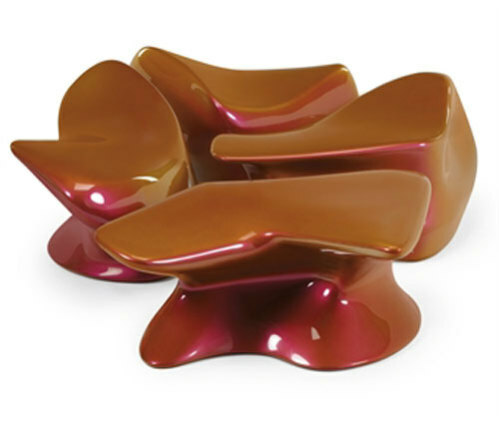 Christie's estimated value is $60,000 - $80,000 for the set of four Nekton stools. Visit them here. 'SCHÖNE AUSSICHT,' literally 'beautiful view,' doesn't make it to the list of traditionally beautiful chairs (It looks like the wheels, and some other parts, may have fallen off the shopping cart. ), but perhaps it offers a beautiful view to one who might sit in it. A sculptor more than an interior designer, West challenges the traditional notions of a chair. He was one of the first to assert that a chair can be made of anything, even odd pieces of iron and steel. 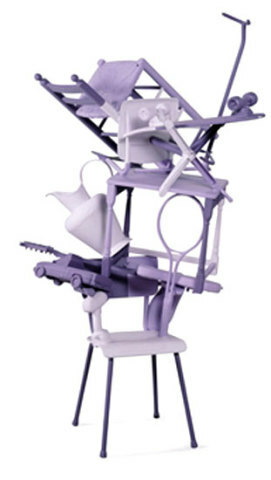 The chair on a platform, though used more frequently now in chair design, was one of the first in contemporary design. Estimated at a value of $12,000 - $18,000, the SCHÖNE AUSSICHT was designed in 1989 and produced by Metamemphis, Milan in an edition of 25. Learn more, or bid, here! 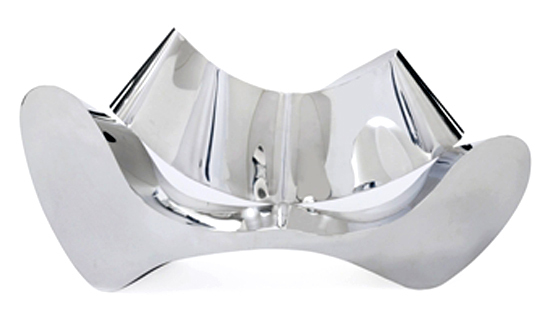 I hope that you visit the collection of contemporary design works being auctioned at Christie's on September 8. You can see them all on-line. The visit will give you an education on the designers and the works that are leading what we now call modern interior design. By selecting these works for this historic auction, this prestigious auction house is demonstrating again why Christie's is Christie's. New York City Tap Water - TAP'D NY™ - Now Available In Bottles!